It was announced at E3 today that Samsung Cloud Gaming, developed in partnership with Gaikai, a leading cloud-based video game platform provider, will stream a mix of family-friendly and AAA video games directly to owners of 2012 Samsung LED 7000 series and up Smart TVs in the U.S. The cloud-based gaming service will be second to none, allowing users access to some of the video game industry's biggest titles, without the need for a console, in much the same way that smart TVs are eliminating the need for a set-top cable box. One of the more exciting consumer-designed perks of the platform is the try-before-you-buy payment plan, allowing users a free trial of any game, so they'll never have to pay good money for a game they end up disliking. 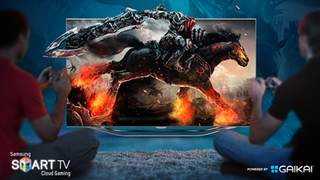 Samsung will soon begin accepting sign-ups for the Beta Test of its Cloud Gaming service on Smart TVs for users in the United States.